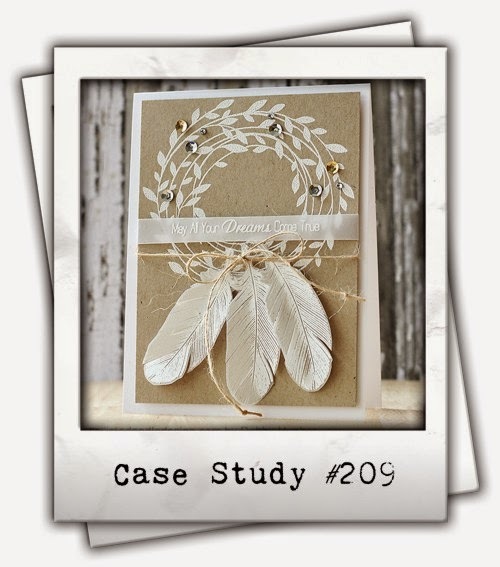 I'm hanging out on the CASE Study blog today and isn't this week's inspiration card by September Muse, Debby Hughes, a beauty? My wreath of leaves was created using Penny Black Creative Dies 51-072 Autumn Jewels. Some leaves were stamped with Penny Black 30-238 Footnotes using VersaMagic Wheat ink and ColorBox Creamy Brown ink. These inks were also added to the outer edges of the leaves. The brown background was created by inking watercolor paper with ColorBox Creamy Brown ink and then applying a thin layer of Faber-Castell Design Memory Craft Gesso on the top for a white washed effect. The additional die cuts (Penny Black 51-014 Nature's Song and 51-050 Tweet Things) were inked with Ranger Archival ink in the colors of Dandelion and Orange Blossom. The background panel was splattered with Walnut Stain Distress Marker ink, colored onto my acrylic block and then flicked onto the background with a paintbrush and water. Sentiment by Penny Black, 30-243 Amazing!.